Every motor vehicle must be registered in the State of New Mexico. Vehicle owners cannot drive a vehicle in Mexico until it is titled, registered, plated, and insured first. Vehicle registration in New Mexico must be processed in person at a New Mexico DMV office. Residents of New Mexico must title and register their vehicles in Motor Vehicle Division before they can operate their vehicles. If you’re a new resident of New Mexico, you need to register your vehicle with the MVD. For out-of-state vehicles, a VIN inspection is required. The inspection is usually done by a MVD agent at a local MVD Field Office. Registered vehicles will be issued registration plates that shall be securely attached to the rear of the vehicle, however, the registration plate of a road tractor or truck tractor shall be attached to the front. If the plate is lost, damaged or becomes illegible, the owner may obtain a duplicate or replacement plate from the MVD upon payment of fees. In 2012, New Mexico won an award for Best License Plate in the U.S. Aside from the standard license plates, there are a variety of specialty plates available to New Mexico drivers. Motor vehicle and motorcycle owners may apply for a special “prestige” or “vanity” registration plate. To order online, just go to Online Services and click on Personalized Plate Application. Shipping of Prestige Plates is free of charge. New Mexico is a “Vehicle Plate to Owner” state. Owners of registered vehicles may apply for transfer of the registration plates to another vehicle of the same class or type. The MVD may assign the plate and registration number to the newly acquired vehicle upon payment of the registration fee, if applicable, and only if the application is made in the name of the original registered owner. Buying a used car in New Mexico? Don’t make a costly mistake. 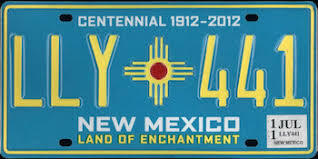 Run a Free License Plate Lookup for your New Mexico-registered vehicle! Run a Free New Mexico License Plate Lookup to uncover the full-story of your New Mexico-registered vehicle.